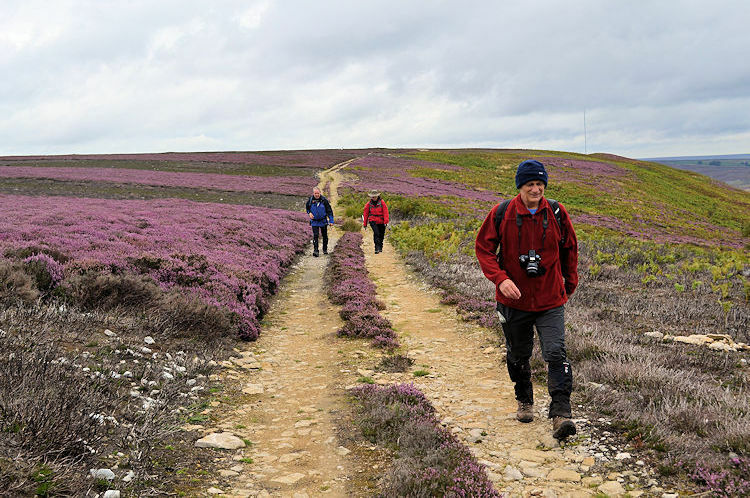 Summary: A long sweeping walk on one of the great upland plateaus in the North York Moors National Park. 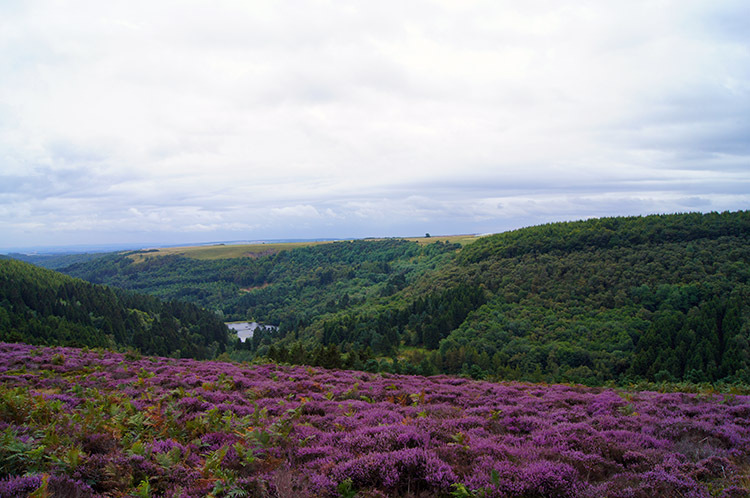 There are excellent views to enjoy on all sides of the moor and a lovely wooded valley walk to finish. 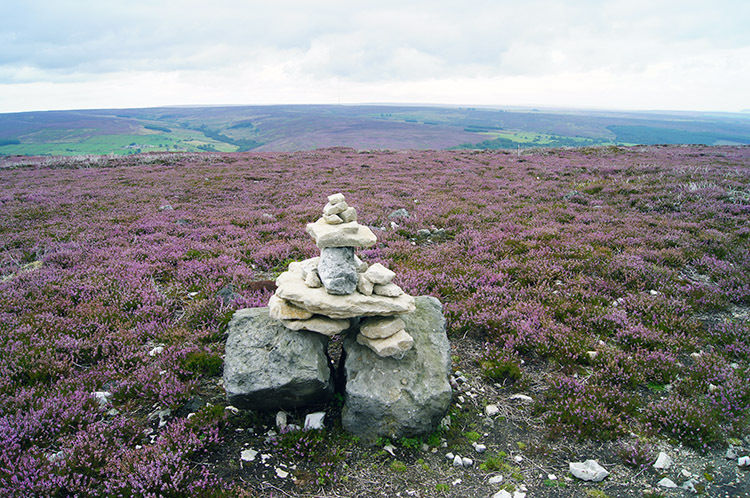 The Walk: Arden Great Moor is found in the south west of the North York Moors National Park. 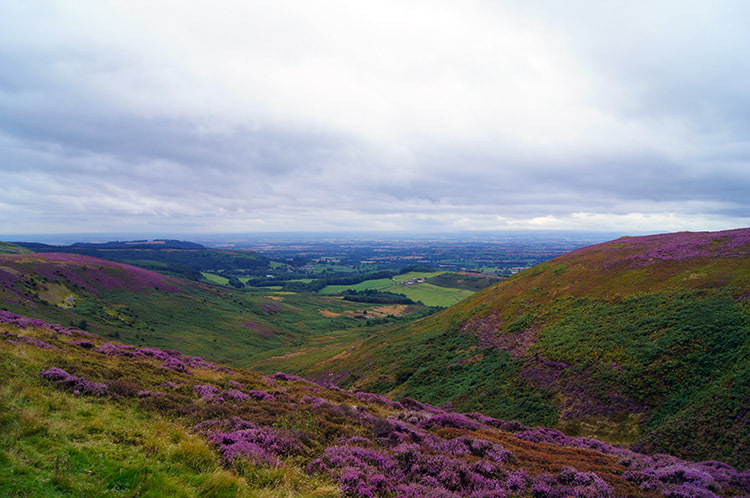 The moor is situated in the Hambleton Hills which look out over the vast flat plains of the Vale of Mowbray to the west. There are great views of the Vale of Mowbray and the eastern hills of the Yorkshire Dales to be enjoyed in the early stages of the walk. 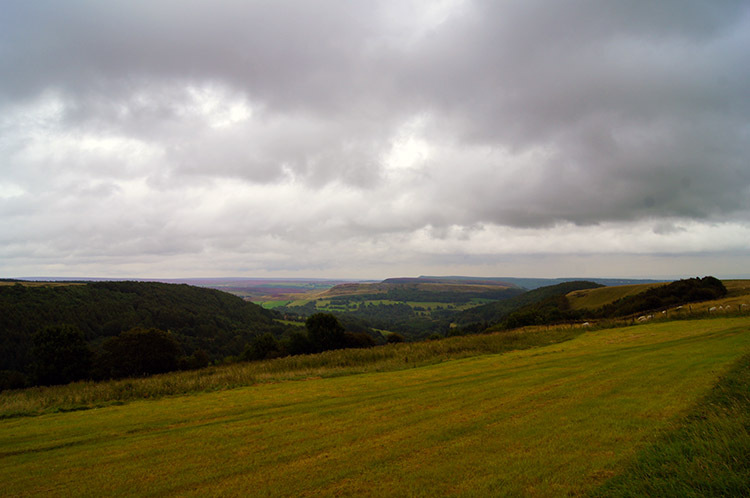 To the east of the moor, across the Rye Valley are the Tabular Hills which include Helmsley Moor and Bilsdale Moor. 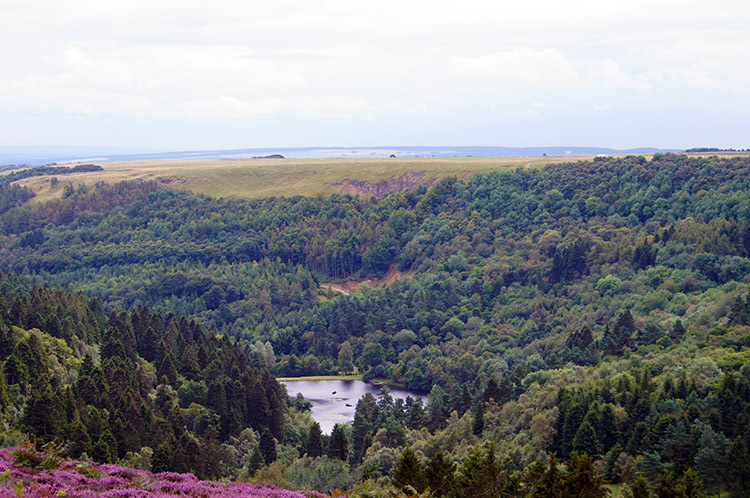 Views to these and the valleys which separate them are to enjoyed during the second half of the moor top circular. 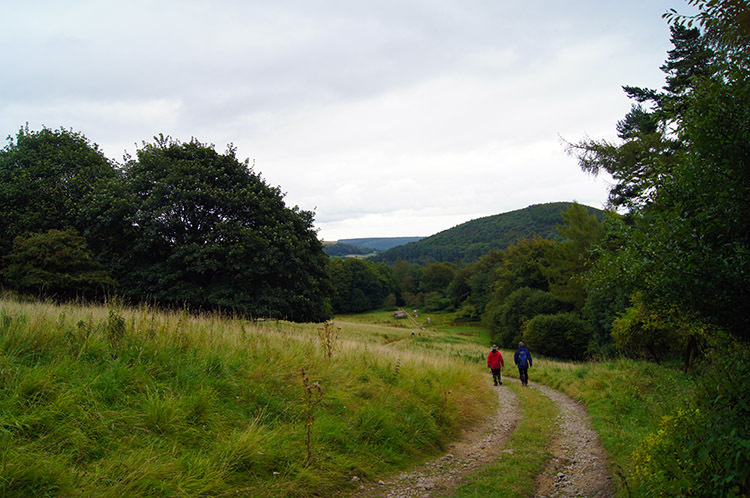 Finally when the descent from Arden Great Moor is undertaken the finale of the walk is a lovely walk through Thorodale to Arden Hall. I was in the company of Dave, Jez, John and Joanne. After meeting up in Hawnby we followed the road from the village which heads west and north-west to Arden Hall. At the end of the tarmac road, just beyond the turn off to the hall we parked up by the roadside and walked up Arden Bank in a westbound direction, soon climbing beyond the tree line and making our way through a gate towards the open moor. 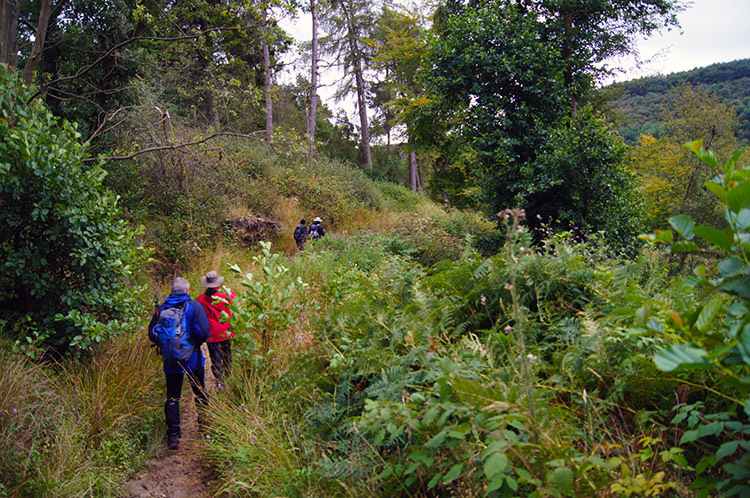 Soon afterwards we past the site of a disused quarry and once past the quarry our ascent was completed. We could now enjoy a gentle outdoors excursion as we circled the moor. The best views to be had in the first place were behind our direction of travel, in the east to Hawnby Hill and Easterside Hill, subjects of an earlier walk in the area some years ago. Early rain which we started the walk with, slight drizzle to be exact had petered out by the time we began strolling out across the moor. Clouds sweeping over from the west blocked out any chance of sunshine but the views into distance were still good. It was clear air, not murky with mist or fog to inhibit the view. I was pleased with that, it is always great to see the views you had hoped to after making the effort to venture out for a good walk. 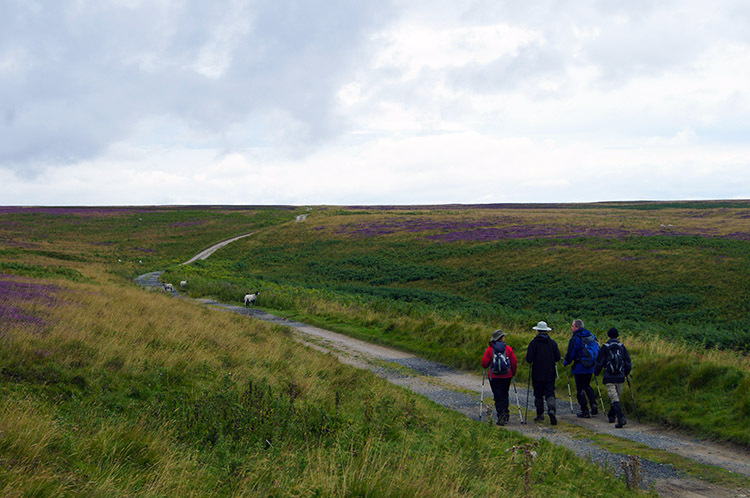 We continued walking and chatting for the next mile of walking until we reached a junction of paths on the eastern edge of the moor which heralded our joining of the Cleveland Way National Trail. Our course changed from west to north on doing so. We followed the Cleveland Way on a direct line due north, following a parallel line to the western edge of Arden Great Moor. On this stretch I became detached from my walking colleagues for while they maintained a good steady pace I stuttered and paused a few times, not due to any ailment or suffering, but rather to take in the tremendous views out to the west over the big expanse of the lowland table flat gap which is the Vale of Mowbray and which sits between the western edge of the North York Moors and the eastern edge of the Yorkshire Dales. A dead straight line due west of 25 miles would take me to Leyburn on the edge of the Dales and a further few miles to Penhill, one of my favourite Wensleydale hills and one which I could see. In the more immediate distance I made out the villages nearby including Kepwick and Nether Silton. My observations of the views on offer and the time I took to take sufficient photographs put me about 250 metres behind my walking group and for the next couple of miles I maintained the distance gap. Occasionally I would draw closer to them and then be reverted to my former distance gap by taking more photographs. After the northwards stretch of the walk following the Cleveland Way and keeping north a little more after White Gill Head the track circumnavigating the moor curved as it first turned north-east, then east, then south-east. 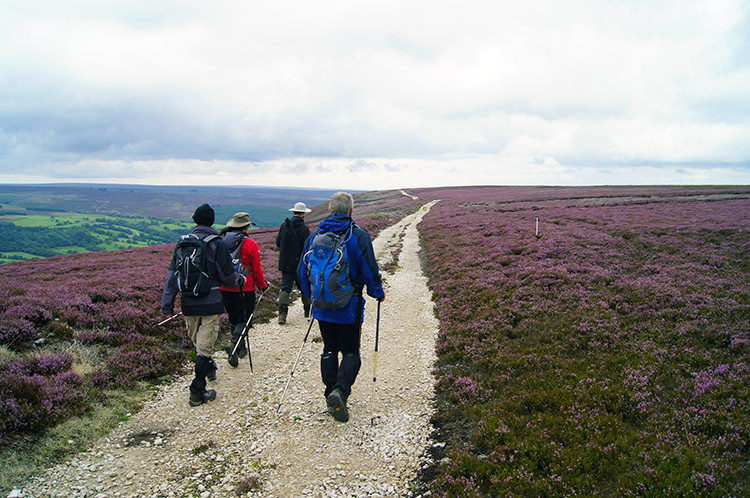 The walk around the north side of the moor revealed constant changing aspects of the distance moors as we turned with the track, north to Osmotherley Moor, north-east to Snilesworth Moor and east to Hawnby Moor and Bilsdale Moor. 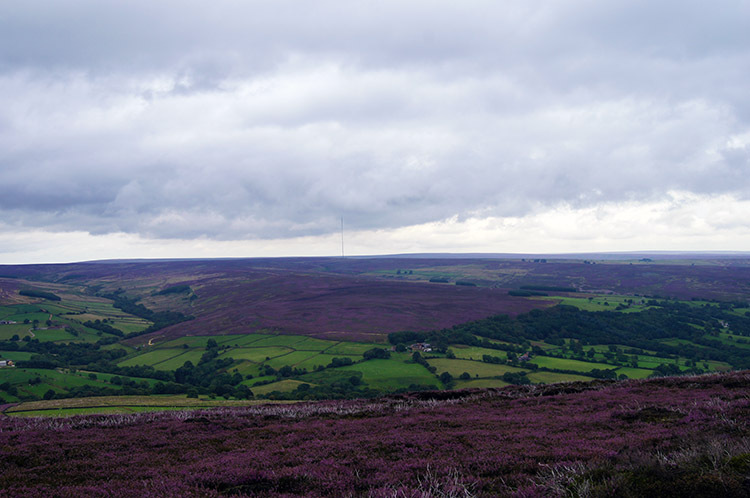 The transmitter on Bilsdale Moor made it an easy spot. 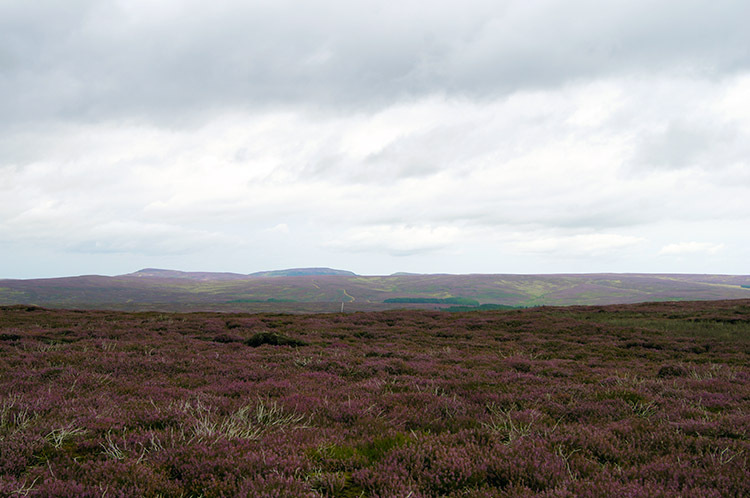 Looking out to the distant hills and moors was a natural draw but I kept alternating the view with glances into the heart of Arden Great Moor which was wearing its best dress, a complete envelop of purple Heather blossom. After Sun Bank I caught up with the team, not because I injected any acceleration of pace but because they all waited for me to catch up. We continued on our journey around the moor which first took us past Haggworm Slack - whoever conjures up some of these place names? - and then on a meandering walk around of the head of Eskerdale Beck which flows east from the moor for one and a half miles until it flows into the River Rye. I chatted with Jez and Joanne for a while, subjects being politics, recent events and the like before leaving them to continue the debate while I marched on towards John and Dave. While I walked off in my personal space I wondered what subject of discussion I would join up ahead. The final section of moor top walking turned from south to west as we rounded Harker Yates Ridge though why it is defined as a ridge confounded me, it being as table flat as the rest of the moor. On the course west Arden Moor Moor assumed a greater feeling of vastness though. We looked across to a line of trees in the far distance which we had walked closely by earlier. They looked to be miles way, an illusion as thy were less than two miles away. Rubbing our eyes after the moorland mirage we soon spotted Thorodale Wood below us to our left. Our point of upland departure was imminent. 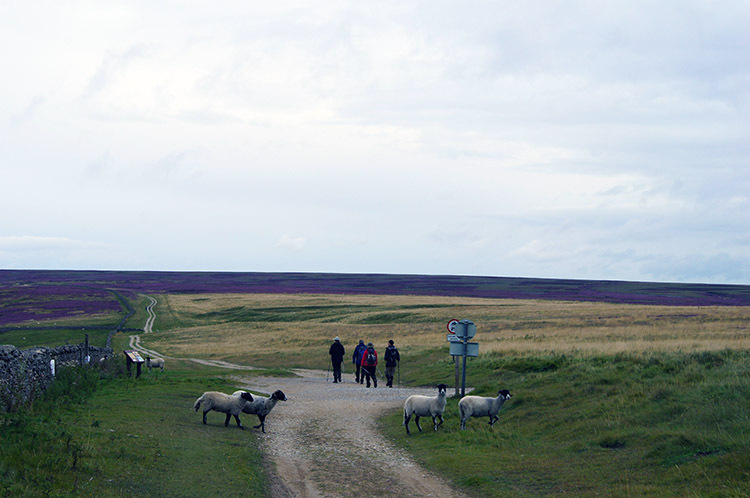 We left the moor by making a switchback to the left and by following a good track which arched from south-west to east. 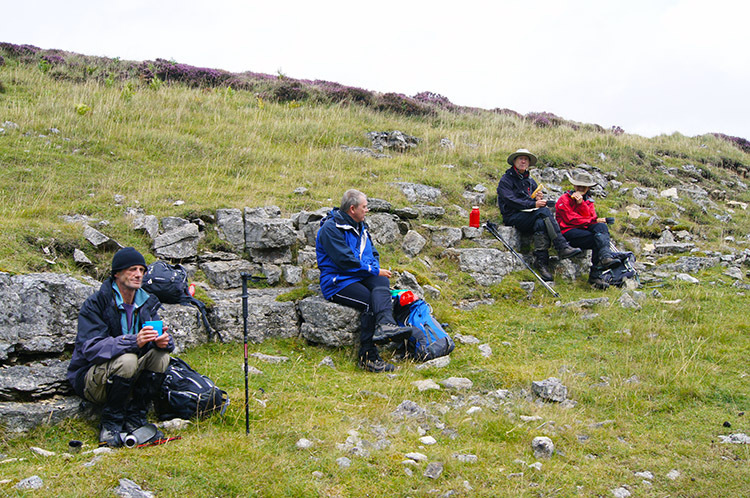 Two thirds of the way on our descent to Thorodale we reached a scattered gritstone outcrop where random rocks made ideal seats for lunch. We each found our own place, rooted out our varying types of sustenance, enjoyed our individual treats, chatted about random subjects, packed up after eating and then resumed the journey. Thorodale was directly ahead of us. Suitably recharged we entered Thorodale by way of a small gate which took us along a narrow woodland track. 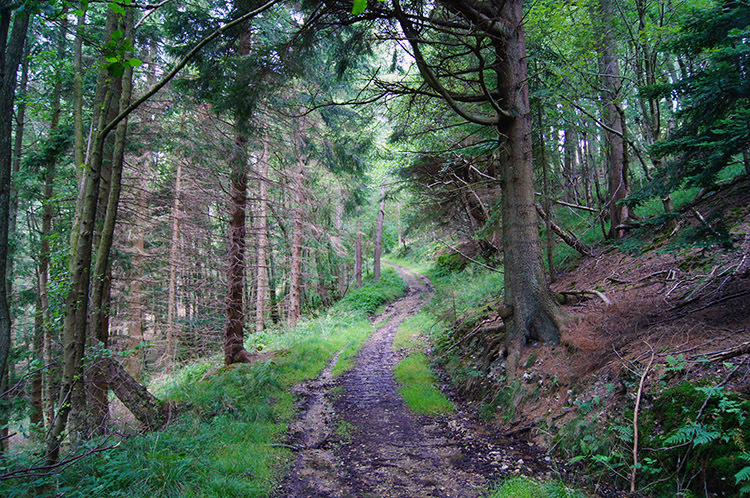 At first the woodland was native deciduous with fern and bracken attempting to invade every unoccupied space which included parts of the path. Each time it did so we beat it back with a vengeance. 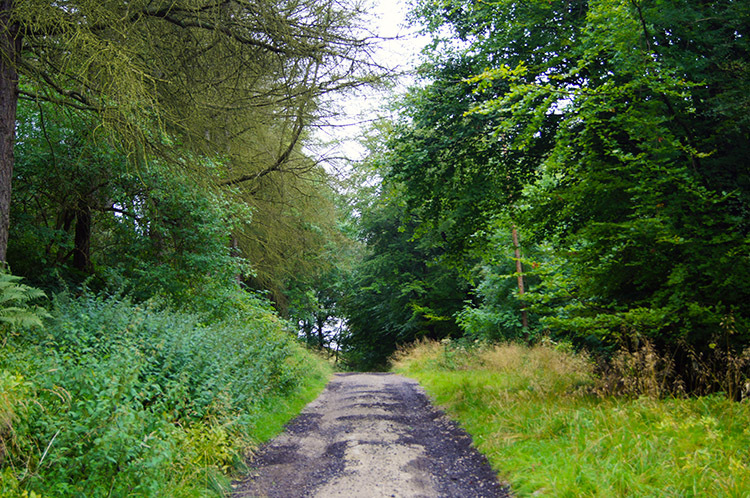 About a quarter of a mile into the valley the path widened as is necessary for tree felling equipment. The beauty of varied deciduous trees had been replaced by uniform rows of conifer. We were now walking on an unmetalled vehicular road through a plantation. The road led us unerringly for a further mile until we merged from the partial darkness of high plantation into a clearing. The clearing led us past stacks of felled tree trunks, stored neatly for collection. I pondered taking a sample for my log burning stove but could not be bothered in making the effort to carry it. Instead I ambled along with Dave and John towards Arden Hall. Jez and Joanne took the vanguard. We soon resumed to form a famous five in the environs of Arden Hall. The hall is the family seat of the Earl of Mexborough and the most famous guest to have stayed, if guest is the right term, was Mary Queen of Scots while on her journey south to her execution. 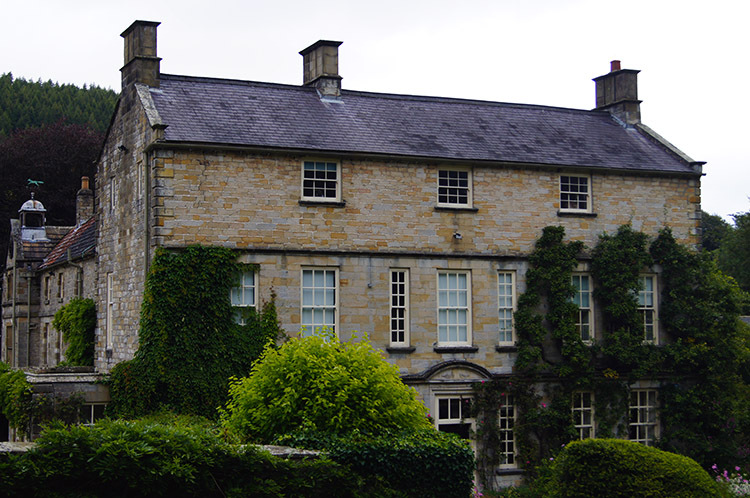 As well as the hall there are a number of cottages in the grounds, I would assume lived in by estate workers. From Arden Hall we walked up the drive to the track where the cars were parked ad then we drove back into Hawnby for a drink in the village pub. 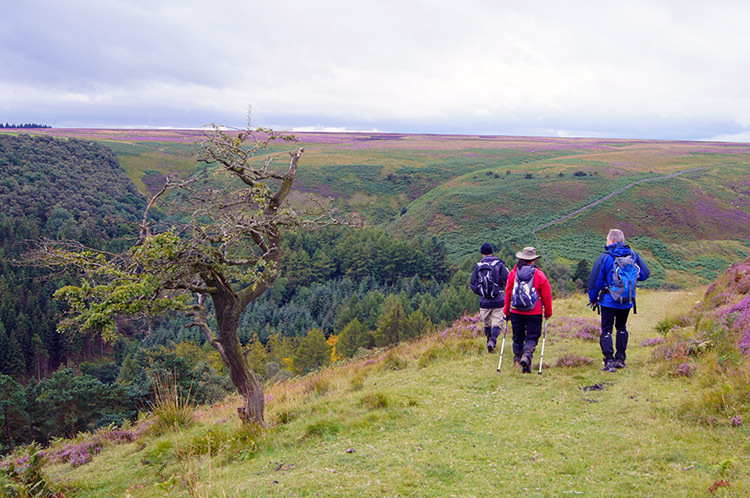 Great walk done, a lovely moor round with some thrilling views all the way around including some Yorkshire Dales hills, the sweeping patchwork carpet that is the Vale of Mowbray and last but not least some very pretty North York Moors dales sat between sweeping moorland.